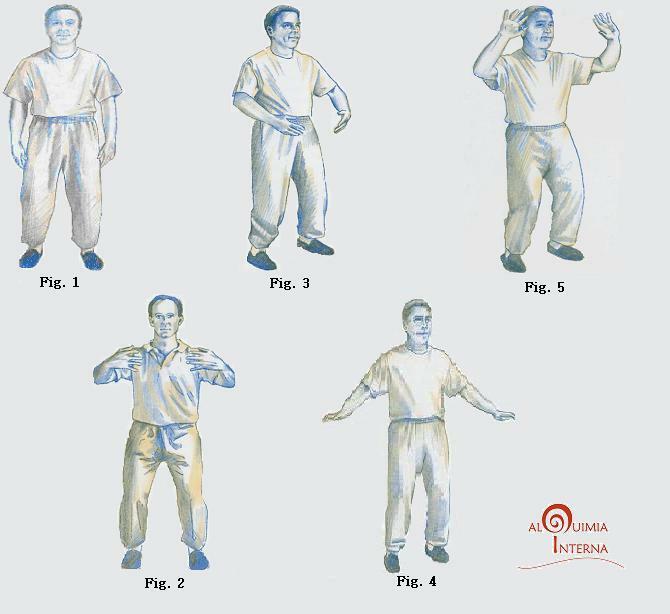 The Zhan Zhuang system is a Static Qigong System exercising both body and mind. Following adoption of the positions that form, there can be no movement. The movement only occurs internally. Attention should be directed toward our breath and this should be slow, abdominal relaxed. 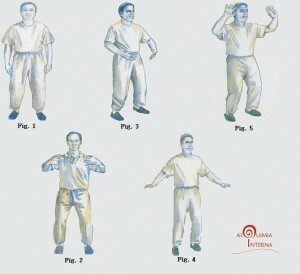 The Figure 1 shows “Primary Energy Position”, “Wu Chi”, position that aligns the mind with the body, through conscious breathing. To properly take this and the following positions, chin should be retracted, placing the tongue touching the palate, tilt the pelvis, bend your knees, not exceeding the feet, and feet parallel to each other. The Figure 2, known as “Embracing the Tree” or “Holding the Ball”, is the most popular of the positions of this system. To properly take this and the following positions, takes as its starting point the position “Wu Chi”. Then flex the knees without tilting the body forward, Gently maintaining alignment between the head, the trunk and pelvic girdle. Then get on your arms in front and form an open circle in front of the chest, to shoulder height, with the palms facing the chest. The elbows are flexed a little beyond the 90 degrees, and are slightly lower than the hands and shoulders. With this approach accelerates the internal energy circulation through the feet, rising throughout the body, to the hands and head. To take the position known as “Abide the Barriga”, as seen in the Figure 3, all you have to do is lower the arms to the height of the belly. This exercise helps to build the growing flow of Chi in the body, specifically in the Lower Tan Tien. “Being in the Current Standing” is the name of the position of the Figure 4. By practicing this posture, produces a high level of resistance to physical level, mental and emotional. To adopt this position you have to raise your arms to the sides of the body to the waist, with palms facing towards the ground. The Figure 5, known as “Hold the ball in front of the face”, is undoubtedly the most difficult and stressful of the above. With it greatly increases the energy flow through the body. In adopting this position have to raise arms and hands turn outwards so that the back of the hands is to the height of the cheeks.